A stampede outside a sports stadium in the Philippine capital, Manila, has left at least 73 dead, many of them women, with more than 300 injured. Tens of thousands of people had gone to the stadium for the first anniversary recording of a popular TV gameshow. The crush happened when those outside started pushing, prompting security guards to close the entrance gate. The Wowowee show is popular for giving big cash prizes in a country where 40% of people live on less than $2 a day. The show, which airs six days a week, normally offers a 1m peso ($19,250) top prize, but Saturday's anniversary edition had doubled that money. "This is a programme that intends to help Filipinos, especially the poor," said host Willie Revillame. "We only wanted to make these people happy." An original death toll of 88 was revised down because of double counting in the confusion of the stampede. 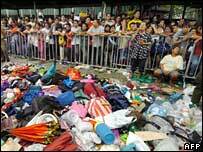 About 30,000 people were waiting to get into the Ultra stadium in the Manila suburb of Pasig - significantly more than the usual 5,000 who attend recordings. The programme, produced by ABS-CBN television, had never used the stadium before. Witnesses and officials said the crush began when guards refused to keep open the gates to the stadium. A spokesman for the network, Rene Luspo, said people started trying to get to the head of the queue and became agitated. "The people from behind, not the people in front, kept on pushing and shoving the people in front of them," he said. "Eventually this gate gave way. That's when the people right in front of the crowd stumbled, and then they piled up." Vice-President Noli de Castro visited the scene of the disaster. "We did not want this to happen. It's just that there were so many people wanting to watch Wowowee because of the big prizes awaiting them," he said. Bodies covered in sheets were lined up beside a police cordon at the stadium. Merquieades Salazar, 45, wept over the body of his wife. The couple, jobless, wanted to enter a raffle run by the programme. "In the desire to win money, she is the one I lost," he said. Presenter Willie Revillame said the show would go ahead to provide information for the injured and their relatives. But police said the show, scheduled to begin at 1300 (0500 GMT), should be stopped. "The show must be cancelled so that people will go back to their homes," said Manila's police chief, Vidal Querol.